Wolf Chiropractic, Massage Therapy & Acupuncture Clinic. Spokane Washington. 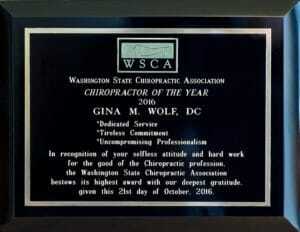 Dr. Gina Wolf. We are proud of our highly trained and experienced staff who will assure your visit to our office is a pleasant experience. We offer a variety of modern techniques for your safety and comfort. You need not be concerned about lengthy treatment plans. We understand that your time is valuable. We pride ourselves on having little to no appointment waiting times. In most cases, at Wolf Chiropractic Clinic, we can see you for your first appointment within the same business day and we offer extended business hours to accommodate your busy schedule. We accept most major insurances, as well as motor vehicle accident and worker’s compensation claims. Our staff will process your insurance claims for you and assist you with any questions you may have. 2016 Chiropractor of the Year! We treat each patient as an individual. Because we know that not all patients respond well to traditional adjusting techniques, we specialize in a number of very effective and gentle low-force treatment techniques, particularly when we treat patients with neck pain. Our doctors work closely with family physicians, physical therapists, specialists and surgeons to assure that you are receiving the best possible diagnostics and treatment available. We understand you don’t have time for pain. You can expect that our doctors will evaluate your condition and tailor a treatment plan that is specific to your needs to assure your quickest recovery possible. Voted Best of Spokane 2014!